Sonicco Acoustic Fire Door Retainer/Release Unit. 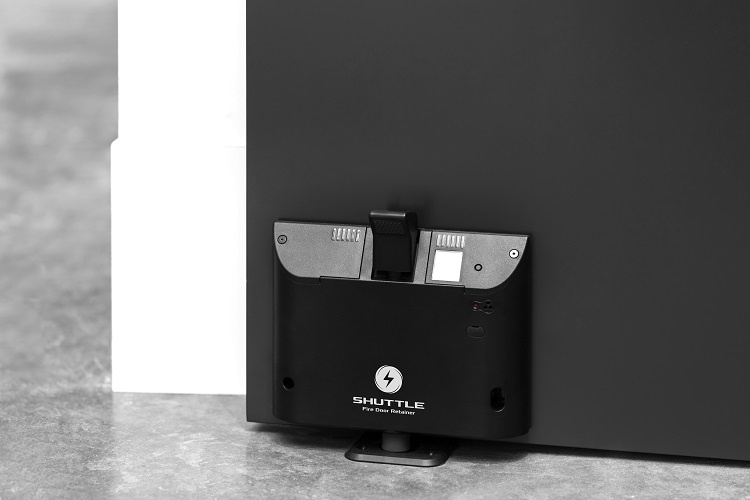 The Shuttle model is a sophisticated, wire-free, intelligent learning electronic device which legally holds open a fire door until the fire alarm sounds. It is an acoustically triggered fire safety device designed to allow closure of the fire doors promptly during an emergency. Fully compliant with BSEN1155 incorporating EN6134 and accepted by UK Fire Brigade. The Shuttle has been designed to learn and recognise each building's individual fire alarm sound and will not react to any other sounds. Once installed on the door follow the menu programme instructions, select "learn new alarm" whilst the buildings Fire alarm is sounding and the unit will record this sound. Hold open the door by pressing the plunger onto the floorplate. In the event of the fire alarm sounding the unit will retract the plunger and allow the door to close. On completion of set up always check the unit functions correctly and the door closes by carrying out a full Alarm test. Periodical checks in compliance with Fire regulations are recommended.